Well, looks like it's time to hear what papa thinks. 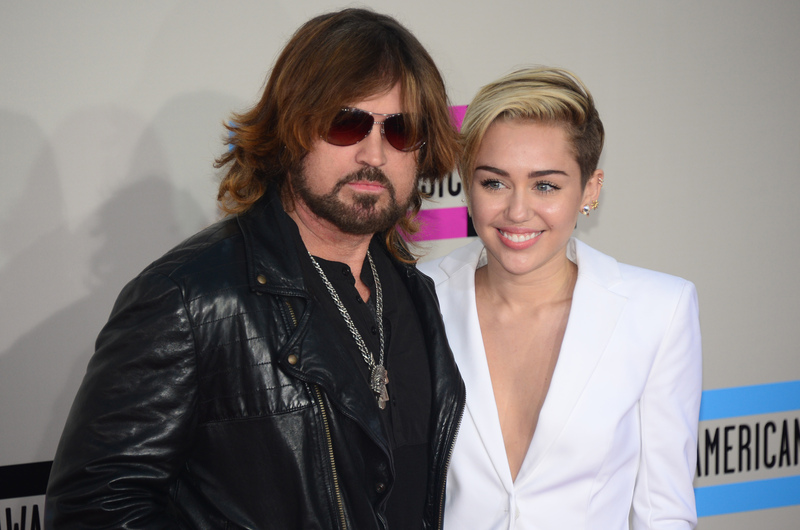 Talking to TMZ, Billy Ray Cyrus gave his approval of Miley Cyrus' boyfriend, Patrick Schwarzenegger. He didn't say much, but it sounds like he's on board for Patty Schwarz even after his recent, uh, endeavors. If you haven't been following the Patrick Schwarzenegger news — first of all, that's totally reasonable — he was involved in a bit of a controversy recently when photos came out that showed him canoodling with a woman during spring break. And, you guessed it, the woman wasn't his girlfriend Miley Cyrus. While in Cabo San Lucas, Mexico, the University of Southern California student was seen hugging a girl, walking arm-in-arm down the beach with her, and doing a body shot off of her stomach. Schwarzenegger later took to Twitter explaining, "Omg. It's one of my best friends girlfriend... Would NEVER do anything against my GF..... Girls have guy friends and guys have friends that are girls..."
Well, that last part is true, and it seems like both Miley and her father believe him. Miley was spotted out to dinner with Schwarzenegger following his trip on Monday night. As for Billy Ray, we he was asked about Schwarzenegger's spring break, he responded, "He had fun. He's a good boy." Well, that settles it. The seven words Billy Ray Cyrus blurted out before jumping into his car and closing the door on the paparazzi prove once and for all that Patrick Schwarzenegger is a standup dude. I just can't help but wonder what Miley thinks of this — not of her boyfriend's spring break antics, but about her dad talking to the media about him. If this was a sit-com, she would now want to break up with Schwarzenegger because if Dad thinks he's cool, he must be a total lame-o. But, as this is real life, I assume that she called up Billy Ray and in her glorious Miley drawl was all, "Ughhhh. Daaaad. That's so embarrassin'. Whuutttt the hellllll???"